I remember when I was about 12 we had game nights and one of the games we used to play was The Game of Life, it was one of my favorites then and I still love to play it with my kids. There is now an updated Yo-Kai Watch version of The Game of Life and kids and Yo-Kai Watch fans all around are going crazy! In the game you can choose to be Nate, Katie, Bear, or Eddie and have adventures through the game. The players explore the city and discover Yo-Kai in different places. It could be the beach, at school, at the park and others. When you spin the game spinner you could be sent in a different and unexpected direction and you can also use the Yo-Kai watch cards to capture even more Yo-Kai. In its simplest form the first player that returns home with 3 Yo-Kai medals wins. You can play the game with 2-4 players and it is recommended for ages 5 and up. I strongly believe in board games as ways to bring people together. I know a lot of families do not have the time anymore to just sit and talk and enjoy each others company. Hasbro is continually making new games and adventures available to bring families together with an activity they all can enjoy. You grab a quick bite, set up your game and the whole family gets to enjoy it! 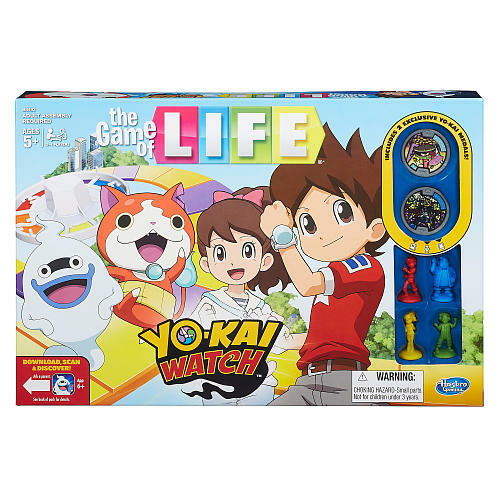 If you have fans of Yo-Kai in your house this is one game that I am sure you are all going to enjoy, it is fun and very similar to the original Game of Life and yet it has enough of the Yo-Kai included to draw your kids in to want to play over and over. You can check out this game and others at the Hasbro Toy Shop and be sure to keep your eyes open for the newest Yo-Kai version of Monopoly.